Can anyone else relate to that? I know that I can. 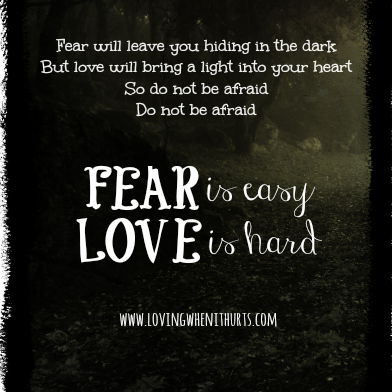 Jason Gray has a song called "Fear Is Easy, Love Is Hard." To say that I love this song would be an understatement. I can really relate to this song. Especially when he speaks to this feeling of fear. I used to live with so much fear. I listen to the words to this song and I can see so many different times in my life when a certain verse or phrase applied. Kris and I talk a lot now about living in the light. There is a line in this song that rings so true. And then, the next part makes my heart hurt. This song is an emotional roller coaster! This part brings people to my heart that are broken and hurting. That are living in the dark, that don't realize how good the light is. How freeing. How incredible. And I want nothing more than to somehow magically communicate to them the truth about living in the light, instead of hiding in the dark. The dark will only lead to more pain. I believe this with everything that is in me, having lived this was for so long. That line, "they'll die without forgiveness soon" really hits home with me. It brings to mind all the lost and hurting people. They will die without forgiveness soon. Now that I get it, now that it is clear and my eyes are open, I'm left with this deep love and concern for all who are lost and hurting. Convinced that they are beyond God's reach. There is good news for you if you are floundering in the dark. You can come into the light and know that God's grace is enough to cover ALL of your sin! Or, you can hide in the dark. But you will go down a path that will lead to death. But the joy it brings is more amazing than you can imagine.